This spread continues the roadtrip and the experience in Colorado. You will notice in the bottom left hand corner is a picture of Casa Bonita, which I highlight on the spread right before this one. I had a lot of fun creating this spread – it highlights pictures from several of the things that we saw while we were in Colorado. One of my favorite things about this page is the picture with the large stuffed bear which is in a truck stop in the middle of nowhere in Colorado. A friend of our exchange student had this exact same picture taken with this bear about 2 weeks later and I realized it when I saw it on Facebook. It really is a small world sometimes. To make the page more interesting I tore some background papers to create the layered border effect on the left hand side of the page. I also tore some transparent paper to create a holder for the Colorado Map. I affixed it to the paper with brads so that there would not be a residue on the transparent paper from a sticky tab or glue. The brads create just enough pressure to help hold the map in place. 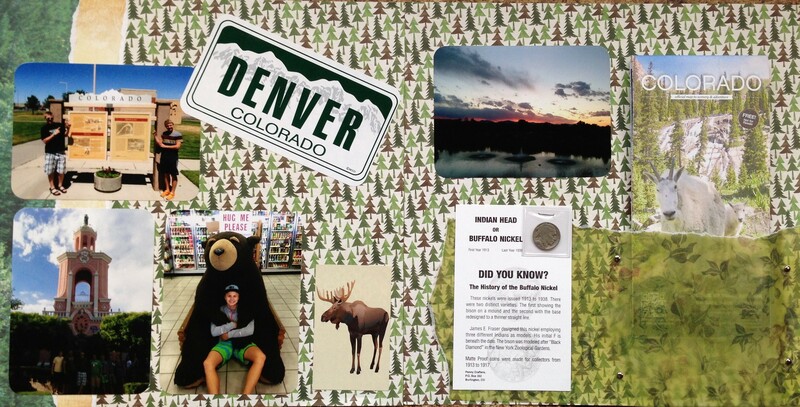 Scrapbooking tip: Welcome Centers and rest stops often have free maps of their state and local area. So they make nice free ephemera for your scrapbook, and serve as an educational tool for others who are viewing your scrapbooks. While the buffalo head coin seems a little random on this page – I purchased it at the same truck stop as the stuffed bear and thought that it would serve as a nice souvenir for our exchange student from the United States.